With the spring winds whipping along the Embarcadero and whitecaps on the bay, summer might seem far away. But, in just a couple of months, school will let out and prime boating season will begin. 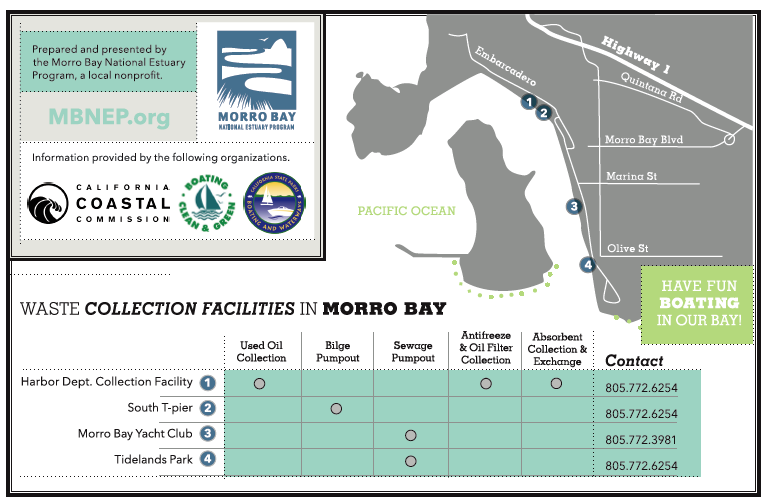 This fall, the Morro Bay Harbor Department distributed kits that included spill prevention, containment, and response materials to all 27 boat-docking stations along Morro Bay’s shoreline. 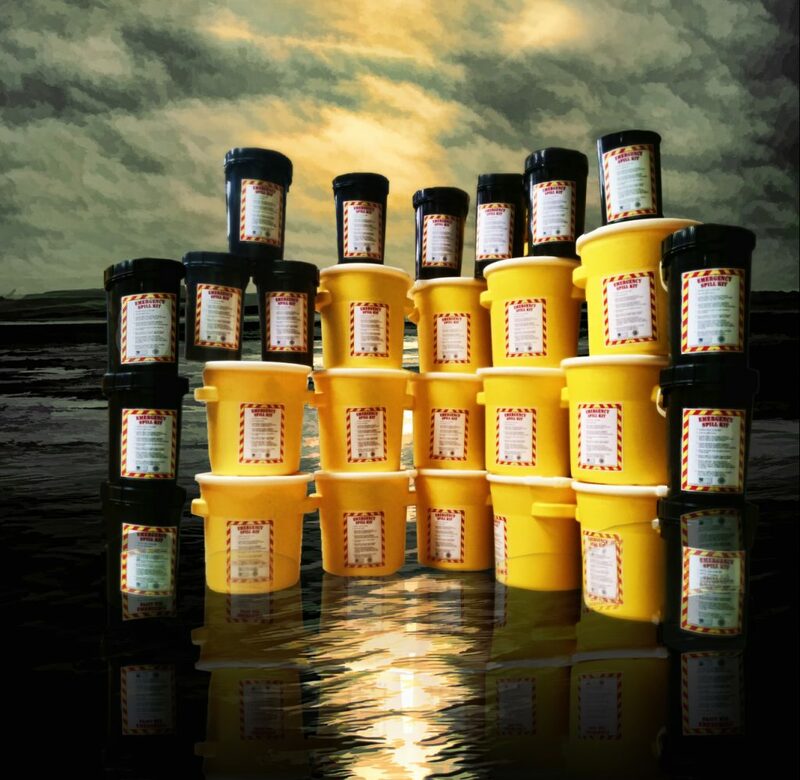 These kits make it easier for boaters to avoid spilling oil and other hazardous materials into the estuary. They also provide instructions, personal protection equipment, and cleanup materials that enable boaters and marina managers to start containing and cleaning up chemical spills even before the Harbor Department arrives. 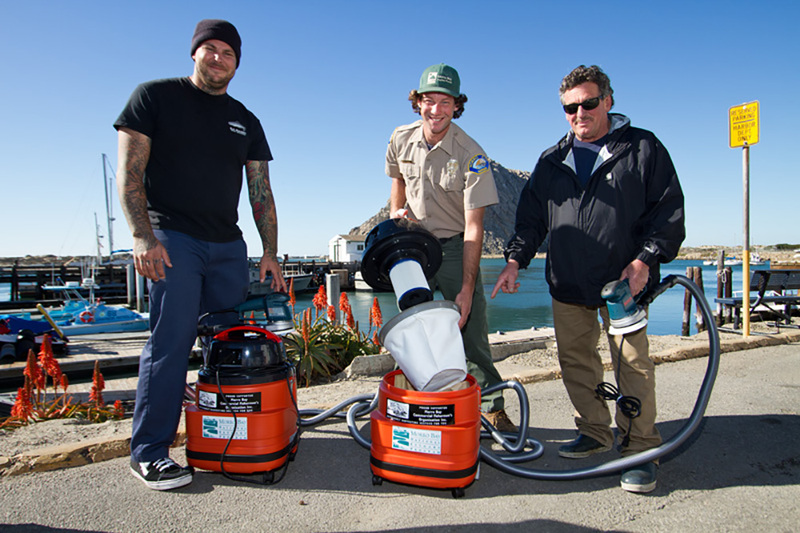 The Morro Bay Harbor Department distributed these 28 spill kits, 14 large and 14 small, to all boat docking stations along the Morro Bay estuary. Photograph courtesy of Scott Mather of the Morro Bay Harbor Department. The purchase of these kits was funded through the Estuary Program’s Community Projects program, which provides up to $5,000 for projects that help improve the health of the bay. Alongside the spill kits, Harbor Department staff distributed 240 clean boating kits from the Estuary Program. That’s one for every boat kept at a dock in Morro Bay. 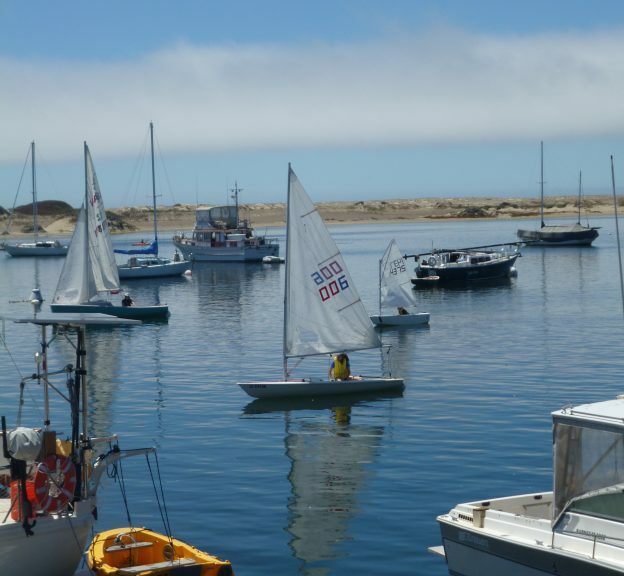 We know that boaters care deeply about the health of Morro Bay. 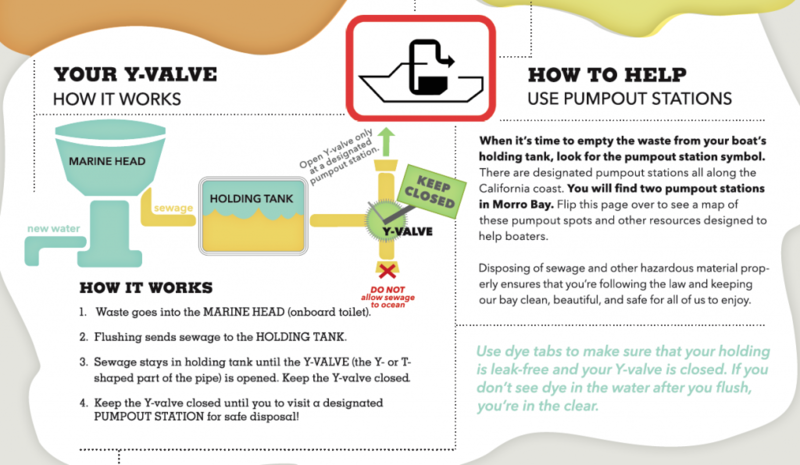 We’re glad to have been able to partner with the Harbor Department to provide these essential tools and helpful tips to help boaters keep our bay as clean and healthy as it can be. You can find the handouts from our 2019 clean-boating kit below, or download them from our library anytime. Here are some important things to keep in mind whenever you head out to enjoy some time on your boat. You’d rather focus on the wind and the waves, but sometimes nature calls. When you flush the head on your boat, untreated sewage moves into your holding tank. Your Y-valve is the only thing standing between that sewage and the bay waters that we all enjoy. Because of this, keeping the Y-valve closed is a must, and making sure it’s air- and water-tight is just as important. Luckily, checking for leaks is easy. All you need is two dye tabs and about three minutes. Purchase the dye tabs from your local marine supply store, then drop the tabs into your head and let them sit for 1–2 minutes to soften. Flush, and then head toward your discharge port to make sure there’s no dye in the water. If the water is clear, you’re good to go. If you see dye in the water, you’ve got a leak that needs to be repaired to keep human waste out of the bay. If your Y-valve is working, keeping sewage in the tank won’t be a problem. But, you still need to find a pumpout station before the tank gets full. If you’re boating in Morro Bay, you can find a pumpout station that will work for you using the map below. It also shows you other resources (like battery and used-oil collection sites) that might come in handy. With hundreds of boats on the bay, it’s important to keep all chemicals, oil, etc. contained—down to the last drop. In order to do that, you’ll want to keep plenty of absorbents on hand to mop up any spills that occur onboard. You can pick them up at the store, or participate in the Harbor Department’s free absorbent exchange program. They’ll fix you up with the supplies you need; just bring them back for recycling once you’ve used them. You can also drop off used oil, antifreeze, and more for disposal. Just give the Harbor Department a call at 805-772-6254 to find a good time to stop by. 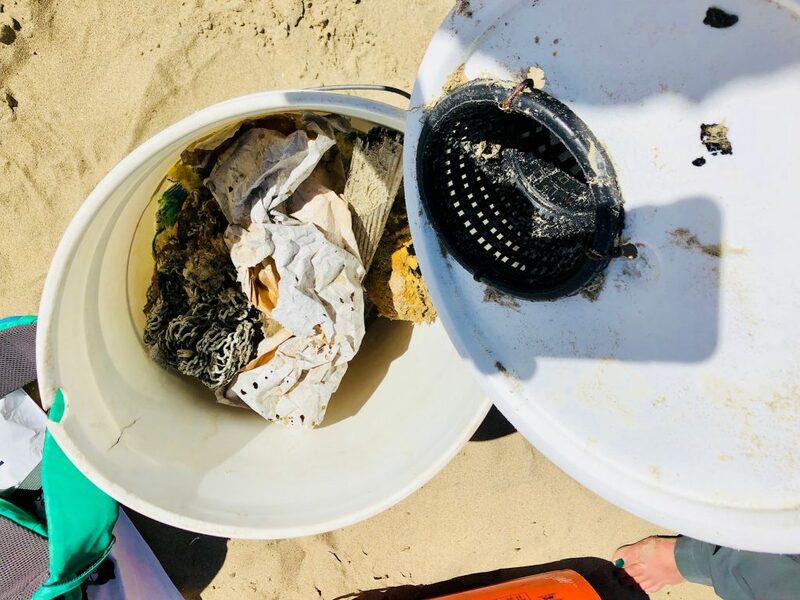 These buckets hold trash gathered from the Morro Bay sandspit. Much of the trash here washes up from the estuary or the ocean. Making sure to keep trash contained whether you’re on land or on the water will help reduce marine debris like this. The Morro Bay Harbor Department also has two vacuum sanders that are available on a first-come first-served basis. These sanders let you do what you need to do to keep your boat in great shape, while keeping harmful chemicals out of our bay. Give the Harbor Department a call before you start your next project to make sure a sander is available for you. The vacuum sanders are portable and easy to use. You can find them on a first-come, first-served basis at the Morro Bay Harbor Department office. 6. 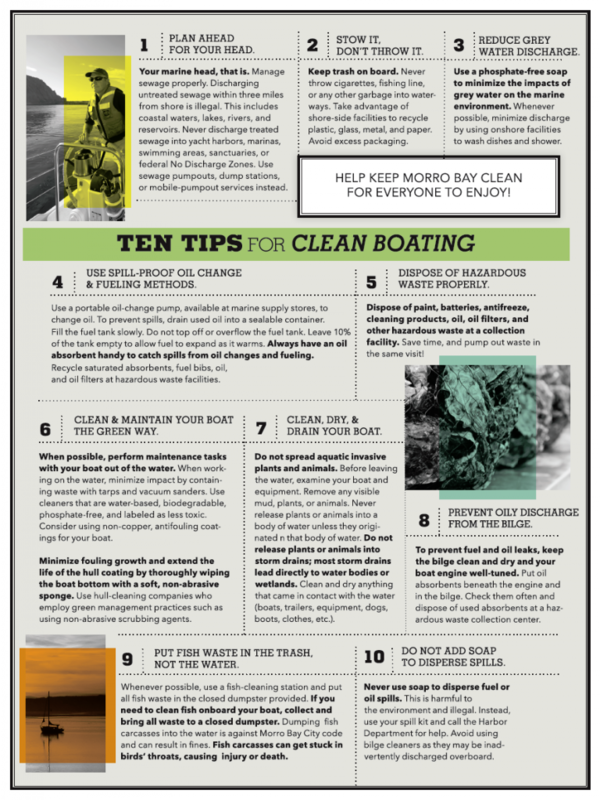 Download our Clean-Boating poster for 10 more tips to help you keep the estuary clean. Subscribe to our weekly blog to have stories like these delivered to your inbox each week. Thank you for helping our beautiful, bountiful, biodiverse bay!